​We are excited to book our first physio event for the CUB, the well-known Physiotherapy UK 2017 Conference and Trade Exhibition in Birmingham. After independent evaluation at the end of the last year, the Comfortable Upright Birth (CUB) support has been included in clinical Policy and Procedure Documents from Cork University Hospital in Ireland as the product for use when caring for women with pelvic girdle and lower back pain in labor. This inspired our team to share the knowledge and to bring the CUB to a larger professional audience. 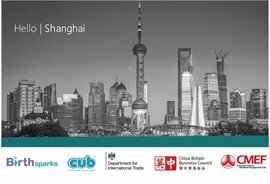 ​Our team are heading to Shanghai on Saturday 13th May 2017 to attend the China Medical Equipment Fair (CMEF) one of the largest of its kind held in the world. Showcasing and Exhibiting our multi-award winning CUB as part of a UK Government trade mission. Should you be visiting the event during the 14 - 19th May, or know anyone who is - feel free visit and say Hi at the International Hall, booth 5.1 P51B. 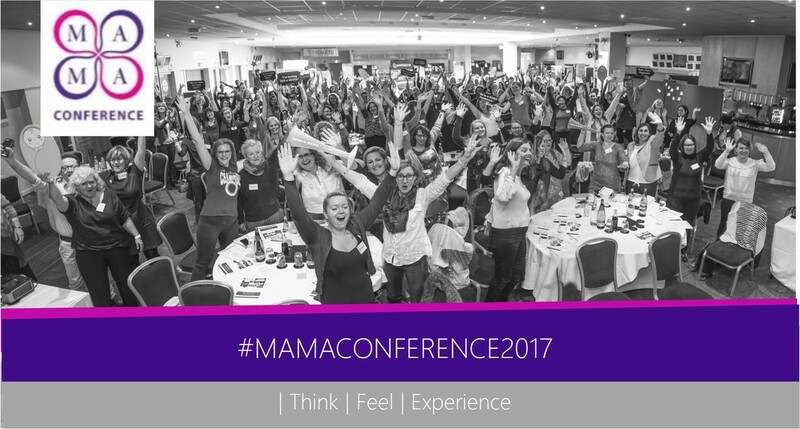 We've now had a couple of days to sit and reflect on what was a pretty incredible MAMA Conference 2017. Creating memories and encouraging our 2017 MAMA community to think, feel and experience something different. We started the conference this year with a selection of images shared by our far-reaching audience, that captured a proud moment in their lives, this set us up for magical two days. MaMa provides the unique opportunity to ‘think’ amongst a crowd of like-minded individuals whilst listening to our inspiring speakers including keynote speaker Prof Hannah Dahlen from Sydney, Australia taking about ‘Does it matter where birth happens’ through to ending the conference with Ina May Gaskin from Tennessee, USA sharing her incredible experiences and stories on instinct and movement during birth. The feeling of belonging, laughing, learning and loving during the two days is extremely important. From all corners of the globe many of our delegates haven't met previously and the conference creates a feeling, as someone nicely put it "like a big cuddle" regardless views, culture or background, MAMA encompasses the sense of acceptance and diversity, sharing stories and knowledge to help positive movement across the world. Many of our wonderful speakers mentioned in their address about the importance of experience during labour and birth. Positive experience is something we all want and seek throughout our lives. MAMA provides an experience that our community can remember and cherish forever. From meeting a new friend, having a conversation that stimulates positive change, or even ten minutes to dance, decorate a cake or be inspired by our speakers - collectively creating something special. To those who joined us in 2017, thanks for being part of it - take the energy and passion back to your place of work and spread the MAMA love. It's now time for the MAMA team to look at 2018 - making it even more spectacular. Keep an eye on our website and social activity where we'll take you on this exciting journey with us. 2018 | 8th MAMA CONFERENCE | Worth the wait. Are you ready for some colour? products, education and resources that inspires real positive change. At Birthsparks we believe in doing things that make our customers think, feel and experience something different. ​best practice, inspiring speakers with some fun along the way. Our CUB is a multi-award winning product that allows mothers to adopt and maintain positions that are not only the most comfortable but physically the most helpful during labour, making giving birth easier, faster and safer, now sold in over 50 countries. With so many exciting adventures planned our Birthsparks family has expanded to enable us to serve and support our customers journey in the best possible way. Jacqui Cunningham has joined as ‘Office Administrator’ helping keep our Birthsparks home organised and ready for business. Frank Gormanley has also recently joined the family as ‘Head of Marketing and Business Development’ supporting us as we continue to enhance our brand exposure both domestically and internationally, he also helps to keep our Birthsparks home clean and tidy, everything has a place! We are delighted to have both Jacqui and Frank join us as we continue to take our vision forward. Founder and CEO wins top award. The Birthsparks family are delighted to announce that our Founder and CEO at Birthsparks Cass McNamara has been recognised at this year’s GHP Executive Awards, Winning ‘Best Maternity Care Executive UK’. Cass has a wealth of knowledge and passion for the industry with a strong vision at Birthsparks to help mother’s, midwives and families globally. We are proud to announce that the CUB support has been shortlisted for the Mother&Baby Awards 2017! With a huge number of entries, the CUB has become one of the 8 products with the highest scores in the category ‘Innovation of the Year’. Please support this fantastic achievement by sharing the news and we keep fingers crossed to find out the final results on the 23rd November! ﻿Because of the CUBs success the Birthsparks team are delighted to announce that they are now in a position to increase access to the CUB for more mothers worldwide by permanently reducing the price of the CUB by a third, this will ensure that the CUB is affordable to more mothers, helping them to have a safer, healthier birth. Birthsparks ltd, based in Ayrshire, are the creators of the award winning Comfortable Upright Birth (CUB) support that is now the most widely used innovative product to reach the mother and baby market globally in recent years. In the last 12 months CUB sales have increased internationally beyond expectations to a level that production costs have decreased significantly. Because of the CUBs success the Birthsparks team are delighted to announce that they are now in a position to increase access to the CUB for more mothers worldwide by permanently reducing the price of the CUB by a third, this will ensure that the CUB is affordable to more mothers, helping them to have a safer, healthier birth. MD and inventor of the CUB Cass McNamara says: “This is a fantastic step for us in growing our business while achieving positive benefits by promoting safer, healthier births worldwide. It was one of our core targets to reach at the end of our first year of sales and because we can now cut our production costs by manufacturing greater numbers the CUB will be more accessible to more mothers around the world, this is such an exciting time for the whole CUB team”. Distributed from the Birthsparks base in Ayrshire the CUB is now used in over half of all maternity hospitals in the UK, 15 states in the USA, Canada, Australia, New Zealand, Norway, Iceland, Denmark, China, India and many other countries too, so the potential for creating the CUB ‘value cycle’ is truly global.